Nothing builds camaraderie among men more than a sports bar (you know, aside from actually being part of a sports team). It’s the ultimate escape for guys who just want to let loose and watch the game. Plus, it’s the best spot to get really drunk, really fast. Below are ten of the best sports bars in the metro. Time to drink and play ball! Skinny Mike’s has been a crowd favorite for years, and we understand why. Every Tuesday, they have a buffalo wings promo that’s the definition of a steal: P15 each! What most people love about the place is the fact that there’s a TV in every booth, which makes requesting for a specific game easy. Skippy’s serves Filipino and Australian food. Unlike most bars, their food is actually good. Like Skinny Mike’s, Skippy’s also has a buffalo wings promo; you only have to pay P10 per wing on Mondays, Tuesdays, and Wednesdays. Loyal customers sing high praises about their unique and flavorful sisig (with a cold beer, of course). Located in Kapitolyo, The Black Boar is a more intimate, low-key sports bar, which is refreshing. Recently, their Chocolate Beer made some noise on social media. If you choose to drop by The Black Boar, don’t risk experiencing FOMO and order the Philly Cheesesteak—it’ll personally speak to you. Attention all basketball fans: THIS IS PARADISE. 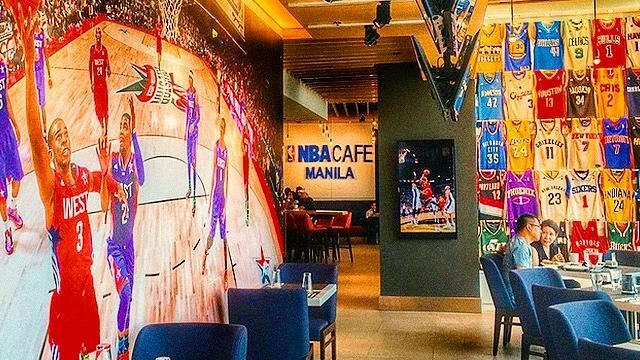 NBA Café is decked out in basketball memorabilias. They literally have an entire wall of jerseys. Like every sports bar, they have great nachos and fries, but their menu extends well beyond that. If you’re looking for a real meal, we recommend their Herb Crusted Salmon Steak. Liberty is different from most sports bars. Their bestsellers move away from traditional bar chow. Customers rave about the Spicy Crab Bao and Miso Pork Belly Bao. Or, reward your tastebuds with their rice bowls—another favorite. Because they focus on Asian cuisine, they also have a wide array of Asian beers as well as craft beers. The name says it all—this bar is for those who have big appetites! In fact, each dish can feed up to four people. The vibe at The BIG Appetite is warm and accommodating; their service is impeccable. Don’t leave without trying the Garlic Parmesan Wings, Cheesy Bacon BBQ Burger, or Cheesy Mushroom Burger—perfect comfort food for when your team’s losing. If you’re a carnivore, Bugsy’s is the place to be. Customers can’t shut up about the Bugsy’s Siegel, which is an Angus Rib Eye steak that’ll leave you speechless. Other items worth mentioning include the Mushroom and Truffle Fettucini, Chicken Rosemary, and Buffalo Tenders. Bugsy’s offers imported and local beers, but we urge you to try the Burn Bugsy Burn. Mulligan’s is the haven of beer connoisseurs everywhere! The bar is molded after traditional Irish pubs! Not only do they have huge servings, Mulligan’s also boasts an endless array of beers. If you’re craving for a specific beer, this bar is your best bet. Howzat is always packed with expats, probably because this bar features soccer and rugby games. The vibe here is really western, which is interesting considering they specialize in Indian food; you won’t go wrong with the Tandoori Chicken. Buffalo Wild Wings is one of the most popular sports bars in the metro. Not only do they have literally all the sports channels you could ever need, they also have other games that can keep you busy (or distracted) if you don’t like how your team’s playing. They have a little under 20 flavors to choose from so you know your wings are in good hands.